sky to out-of-limits wind ... No science data. Others: Lisa, Petri, Janus, Charl. Good seeing night with thin cirrus. At last, a clear night with good seeing! Very windy night with poor seeing. Others: Steve C, Charl, Mauritius visitors Nalini and Dinesh. Cirrussy night with variable seeing. Clear night with SE wind and mostly horrible seeing. Forced to close at 3am due to high humidity. Others: Steve C, Encarni, Charl. => Cloudy night with high humidity. Were closed about 23:00 by humidity. => Amazing night with 1" seeing during the whole night. => Slitmask mechanism problems. Only one mask was available during the night. => Dark night with variable seeing. => Dark night with high humidity and good seeing. but started much better later. Others: Alexei, Fred, Charl, Patricia, Dave C.
Others: Marissa, Anthony, David M.
. Last night for BVIT PI Barry Welsh -- the instrument reinstallation and operation went smoothly and we got some science data, so it was a successful trip! We can safely say it won't be the same without you.
. Clear night with mostly good seeing (~1", up to 2+ at end), dark to gray. The SALT Science meeting was held at SAAO on 6 November. In addition to updates on the status of SALT, partners presented some of their science results. Some of the highlights of the talks include searches for planets, investigation of unique objects, studies of planetary nebula, and next generation instrumentation. The talks are available on the science wiki along with highlights from the work of the SALT Science Committee from the board meeting.
. First few hours were cloudy, during which we carried out engineering tests (timing on RSS slotmode and BVIT), thin cloud the rest of the night.
. First light for the refurbished BVIT! Everything went well, and we even took some science data. Yee-haw. - no science data tonight, clouded out. - BVIT installation is complete, will start functional testing tomorrow. good luck to the commissioning team! On 5 November, the SALT-MeerKAT collaboration meeting was held at the Pineland offices of SA SKA. The meeting looked at the interactions and potential collaborations between the large astronomy facilities available in South Africa including SALT, MeerKAT, and HESS. It brought together members of the different communities to discuss current and future directions of the different projects. Talks for the meeting and the programme for the meeting have been made available for those interested and weren't able to to attend. The meeting had some interesting and exciting results and one of the main outcomes was the formation of a group to explore future capabilities at SAAO to support the large key MeerKAT science projects. Others: Barry, Anton. Keith and Eben early in the evening to help with closing up the NRS. - clouded out for most of the night. opened up after 01:00. seeing again was very good, <= 1''. tried a few proposals but was not successful since the cloud returned shortly after opening. - no data for tonight. - night started out very cloudy. most of the heavy clouds cleared by midnight after which we had moonlit cirrus till we closed. seeing was sub-arcsec for most of the night. - cloudy for most of the night. the thick clouds cleared just before 02:00 when we opened to <1'' seeing. stack was not that great and we could not take full advantage of the seeing. Others: Keith, Pierre, David G.
- clouded out for more than the first half of the night. got on sky just before 02:00 . seeing was good for a change, sub-arcsecond for a while. 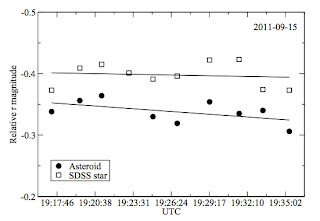 A manuscript describing the physical and dynamical characterization of a Near Earth Asteroid (NEA; 190491 aka 2000 FJ10) has recently been accepted for publication in A&A. Photometric data were obtained at SALT, which were combined with photometric and spectroscopic data taken at other telescopes. An absolute magnitude of 21.54 +/- 0.1 was derived, equating to a diameter of 130 +/- 20 m – in the transition zone between a gravitationally-bound rubble pile and a monolithic body. 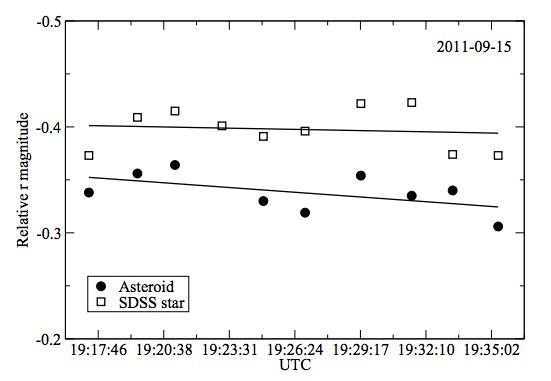 The data suggest that this is an S-type asteroid, which means that it is unlikely to be primitive. Numerical simulations of the NEA's orbit were carried out in order to investigate its dynamical history and predict future locations. The large size of the NEA, combined with its slow rotation (>2 hours) and its orbit, make it a suitable candidate for a human mission. Within the next one hundred years, the optimal launch window was found to be 2047-2059. - dismal start to the semester. had some tech issues, then clouds which was followed by high humidity. - no science data taken tonight. - slow start to the night, closed early due to rising humidity.